A quick guide to successfully build an engaging program in Zunos. Knowledge Checks: 3-5 multiple choice quiz questions to reinforce key points in content. Practice Assignments: Scenarios and exercises for practicing in the real world. Forms: Self-reported learning activities from other sources. Assessments: a) long form quizzes with a pass/fail level; b) submit practice exercises for review. Courses: Content + Knowledge Check + Practice Assignments. Achievements: Group all your learning tasks and milestones to build a program. Where is your content? If you plan and strategize your learning materials first, building your learning program will be much easier. Import HTML files from tools like Articulate or Adobe Captivate. Curate what exists. It will probably already exist online, use it! Create what's new. Document new knowledge, author quickly and simply. Quizzes for knowledge checks to line up with your content. Knowledge Checks are designed to highlight the key takeaways from the content. There is no pass/fail with knowledge checks, feedback can provide the learner with contextual feedback. These are NOT assessments, and designed to be taken as many times as the learner needs. Present scenarios and exercises to your learner to put what they've learned into practice. This can be demonstrating proficiency of a system, participating in a discussion, asking for a written response to a question. The idea is to stop the learner and ask them to do something. Schedule and setup your any instructor-led classes, webinars, or workshops. Learners can self-enroll or be pre-registered. Attendance is tracked and marked off by the trainer. 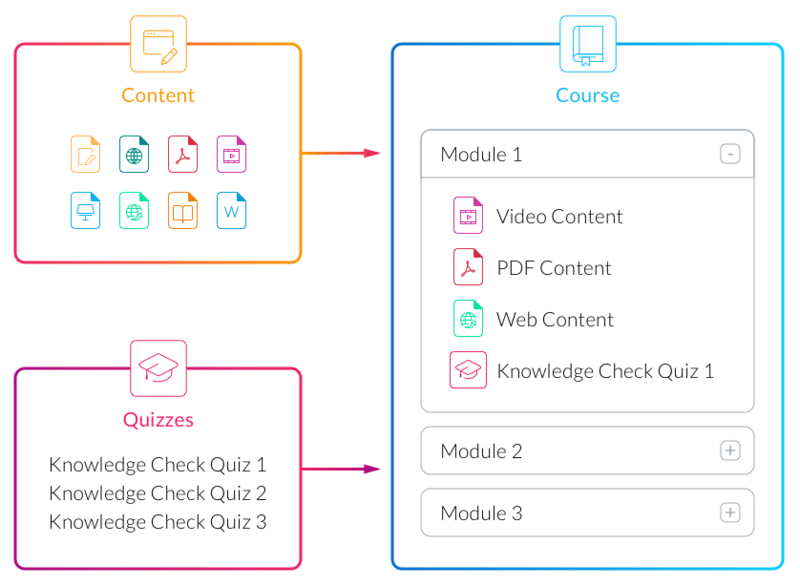 Courses can be sequenced into multiple modules to guide the learner on a linear journey through themes of content. Content can be made available after the course is completed so that it is searchable, printable, and shareable. Achievement groups reward your learners with Achievement Badges and Points for successfully completing milestones and program objectives. Think about the program tracks and milestones what you want your learners to navigate through and name your achievement groups appropriately. 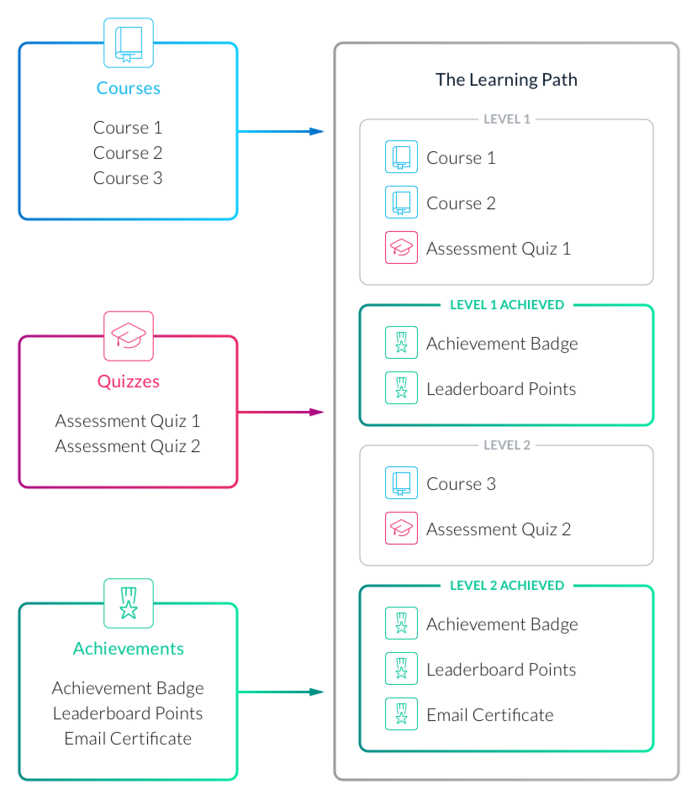 Each Achievement is part of a master Achievement Group, which together highlight the key tasks and activities to your learners in a clear, and visual way. What tasks will they need to perform? Submit a practice exercise for approval of competence. What do you want to reward your learners for hitting this milestone? Leaderboards are a great way to add competition and social proof to your program. 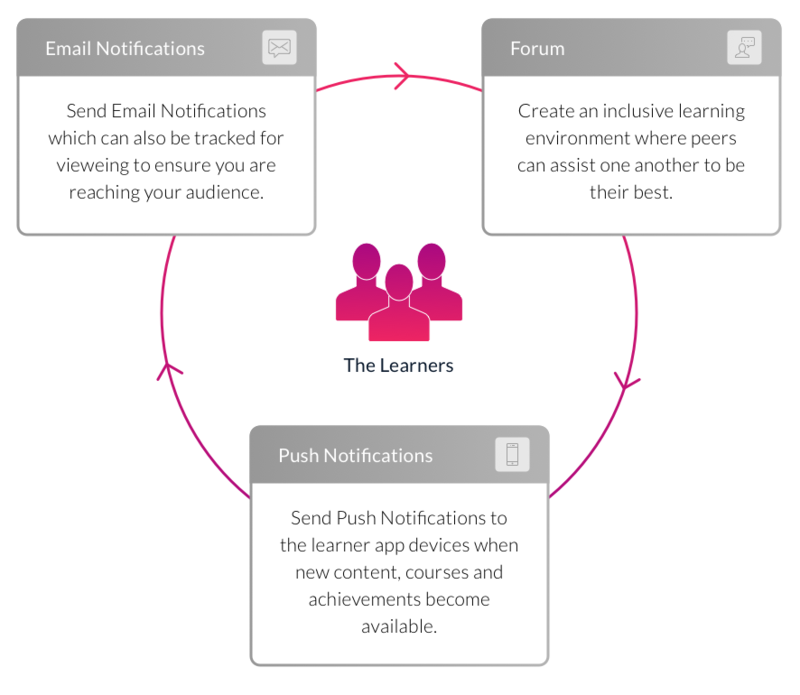 Every Achievement in an Achievement Group can reward Points to the learner. Set your leaderboards up to group your whole community or just specific groups, they will compare scores as well as a breakdown of training and activities performed by their peers. Use your achievement Groups and Leaderboards to trigger rewards. "First person to complete the Achievement Group earns..."
"Top place on the leaderboard each quarter wins..."
Be creative and socialize those winners! No program should be a one-and-done, learning needs to be continuous. Advertise and reach your learners with different communication tools to engage and motivate them to learn anytime and from anywhere. You already have the vision of how you want your training program to look. Take the time to plan the content, identify the goals for your learners, and start today!